Regular readers of this space may remember my fixation with car magazines, and how I’ve whittled down the number I read each month because so many of them feature the same cars. What I haven’t mentioned is the fact that I’m tiring of reading about Ferraris, Bugattis, and all of the other stuff no average Joe/Jane ever obtains a payment book for. So I decided to start a feature called Real Cars for Real People and write about the cars you and I are more likely to buy. We’ll leave the dream cars to other people to cover. So I headed on over to the Ford media page, where I was all set to give you the latest news on one of my favorite family-type hatches, Ford’s Focus. Then… I came upon this electric blue Focus RS. Which automotive journalists have been covering like it’s the second coming of sliced bread. Sorry. But it pulled me in. No, I know that most Moms and Dads will never want or buy a Focus RS. Not with a starting MSRP of $35,900. You should know though, that it comes with all-wheel drive (for handling purposes more than being a winter driving aid), a unique 2.3L EcoBoost® engine which should put out about 350 hp (hmph, my ’74 Pinto also had a 2.3L motor but it couldn’t get out of its own way), bolstered Recaro seats (to keep your behind in place through those s-curves), a flat-bottom leather-covered steering wheel, metal pedals, and unique instrument graphics. Ford’s all-new Focus RS makes its global public debut at the Geneva Motor Show; introducing innovative technologies including Ford Performance All-Wheel-Drive, delivering the ultimate fun-to-drive experience. Styling of the RS is set off from other Focuses (Foci?) by the use of a new grille & bumper with large openings to let gobs of cooling air into the engine compartment; and by large brake-cooling ducts and vertically-mounted fog lamps. Heading over to Ford’s website to build my own RS, I discovered that this striking color is actually called Nitrous Blue. Other available colors are Shadow Black, Frozen White, and Stealth Gray. It looks great in any of them. So I guess the Real Cars for Real People will have to wait a week or so. Unless there are any more distractions out there on the web. 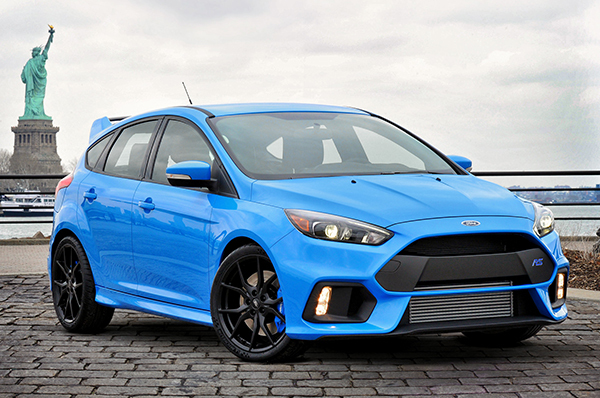 Read all about the Ford Focus RS, see more photos, and build your own right here. 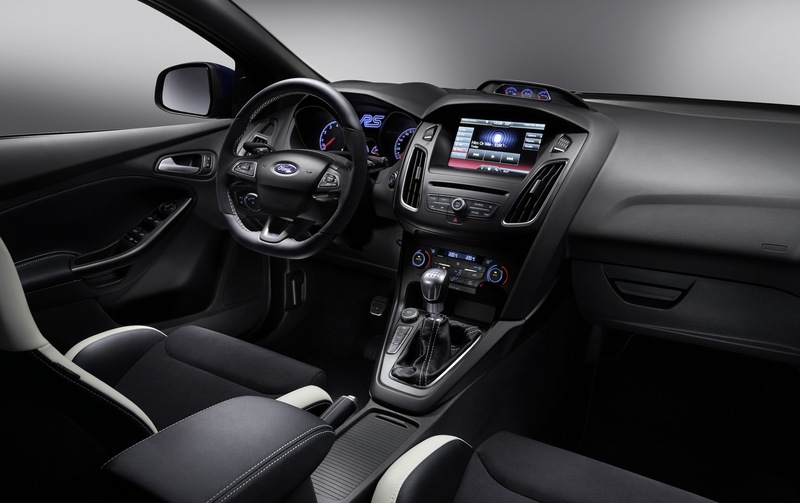 The post NEW FORD FOCUS RS MAKES US REDEFINE THE TERM “FAMILY CAR” appeared first on Buffalo Cars.